Falvey Memorial Library :: Have You Found the Easter Eggs in our Website? Have You Found the Easter Eggs in our Website? The Easter season is upon us. As such, it’s a good time to point out a few Easter eggs, little-known yet valuable features, waiting to be discovered in the library’s website. Favorites—Want to keep track of an item? Save it to your personal Favorites list right from within the catalog. Simply click the “Add to Favorites” link and enter your Villanova account credentials: you’ve saved your item. To access Favorites, click “My Account” on the library’s homepage and log in using your Villanova credentials; your favorites will appear under the Favorites section of the “My Account” page. Since the catalog uses your Villanova credentials to establish your account automatically, everything is ready and waiting for you to use. Your favorite item’s catalog record features options for saving and tracking. Save Your Search—Sometimes, though, you want to save a whole search-results list. You have two options: first, the catalog keeps track of your searches from the current session. To access these search histories, log on to “My Account” and click “Your Saved Searches.” Save a recent search by clicking its “Save” link, which adds the search to “Your Saved Searches.” Option two: save a search directly from the search results page by clicking the “Save Search” link at the bottom of your results list. The “Your Saved Searches” section in “My Account” shows any searches you’ve saved for later reference, as well as your recent searches. Tag It!—Do you ever feel that an item should have a search term or category associated with it, but it doesn’t? Our catalog allows you to add a search term or category in the “Tags” section of the catalog entry. Simply click the Add button in the “Tags” section to add any term you feel is appropriate. Since our catalog allows you to search records by Tag (use the dropdown menu next to the search bar and select “—by Tag”), you can use this feature as an easy way to re-find any items you set with these tags, as well as help others find a catalog record of all your tagged items. The “Tags” section of the record shows the item’s user-added tags, which help others better hunt down the item in the catalog. Comments—Add a comment to your favorite (or least favorite) item’s catalog record. At the bottom of the record is a section that allows you to add comments on items (under the “Comments” tab). Some works will also have excerpts and professional reviews. Again, since the catalog imports your Villanova credentials, you don’t have to create an account to Comment. Simply type your comment, click “Add your comment,” then enter your Villanova credentials. Your comment will be added. It will be a comment for the ages! 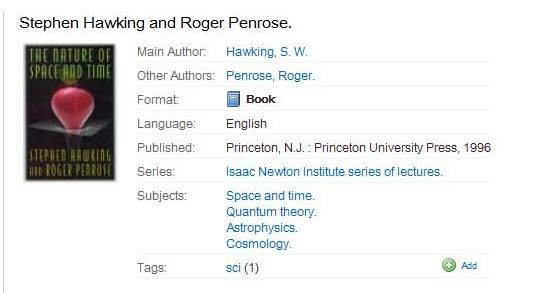 Track Changes via RSS Feed—Suppose you’re interested in theoretical physics and want to be updated when the Library gets new resources on this topic. Creating your RSS feed is easy: perform a search on the topic you’re interested in, then scroll to bottom of your search-results page and click the “Get RSS Feed” link. Your new RSS Feed will now inform you whenever our catalog gets new materials on the subject. The sharing tools found at the bottom of the search results page. 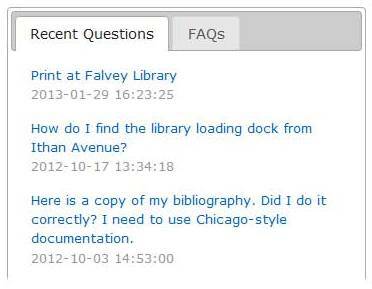 Beyond the Catalog—Our Question Center allows you to ask our librarians a question; they, in turn, can now easily publish both question and answer directly to our website. This blog has developed into a dynamic “FAQ.” To access the Question Center, click the Get Help tab, then the Question Center sub-tab. Here, you can look through old questions or ask and publish one of your own. In the “Get Help” section, be sure to click the Tips & Guides sub-tab: a rich resource of information on everything from citations, to writing, to evaluating sources. One more Easter egg—In addition to lending materials and managing databases, the Library takes part in many and varied projects. For example, Falvey hosts and manages several different academic journals, including Concept (an interdisciplinary journal of graduate studies), Expositions (an interdisciplinary journal of the humanities), Journal of Catholic Higher Education, American Catholic Studies and Praxis (the journal for Theatre, Performance Studies, and Criticism). We also have an extensive digital library collection and have even developed our own digital library software (VuDL). Incidentally, the Library offers digital exhibits as well as our displays on our first floor. You can check out our Projects page to see a list of some of the other library projects that are in progress. If you have any questions on the features presented in this article, feel free to contact us, or use this opportunity to give our Question Center a try. Happy Easter egg hunting! David (Dave) Uspal is the Senior Web Specialist for Library Services and Scholarly Applications at Falvey Memorial Library.